Last month’s kit was one of my favorite Paper Pumpkin stamp sets! I used every single stamp that was included in the kit on different cards and projects! I was all about coloring and I just wanted to keep trying different color combinations, etc. I was not a fan of some of the paper designs that was included in that kit but it was no big deal because I just turned the cardstock over and stamped on the solid side and still made use of everything in my kit. My Paper Pumpkin Players loved coloring with markers and making many alternative ideas. Here are some of the cards they made. Marisa couldn’t hold all of hers at once…she made 9 cards in less than 2 hours! Paula is showcasing my favorite card on the left…such pretty fall colors and I love that burlap ribbon! And I got ALL of that for only $20! It is SUCH a great deal!! Want to try it for less than $20? 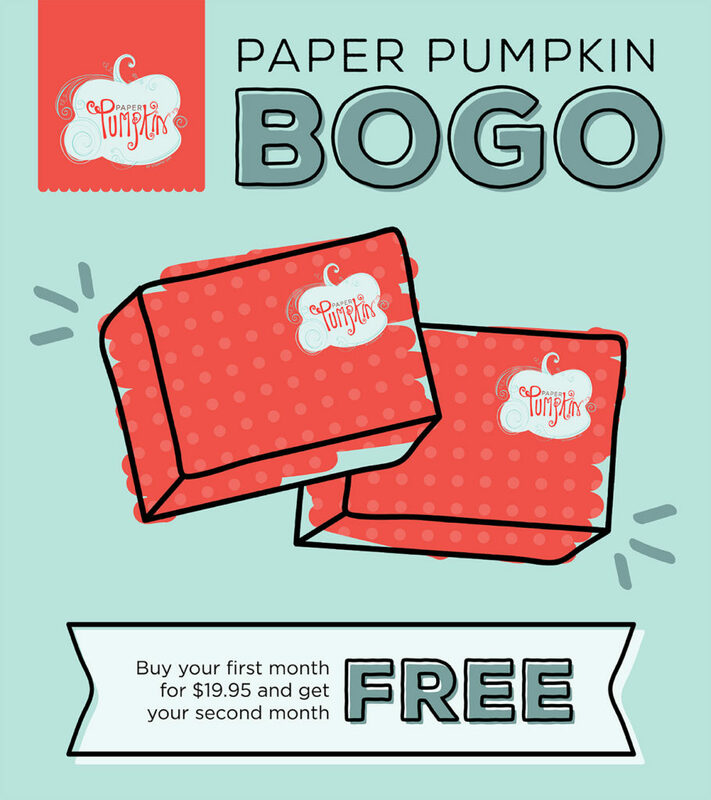 Now until October 10th you can join Paper Pumpkin and BOGO. See all the details below! Click on the Stampin’ Up! video image below to see everything in the September Paper Pumpkin Kit! It has the cutest idea for Halloween treats! The test tube treat holders can be used for more than just Halloween! You could add sunflower seeds for a fall treat or Thanksgiving table favor, bath salts or cocoa for a Christmas gift or stocking stuffer. You have lots of extra tags and banners to use on other projects. Here’s an awesome video showing alternative ideas for this month’s Paper Pumpkin. Need refills for the September Paper Pumpkin Kit? Click here to purchase refills while supplies last. You must be a current subscriber to purchase refills.Refills are just $8 and you get everything except the stamp set and ink spot. BOOK A MONTHLY DATE WITH PAPER PUMPKIN! Get your 30 minute “fix” of paper, stamps and ink every month. Learn more here about the options for adding pre-paid Paper Pumpkin kits (1, 3, 6 or one year subscriptions) to your next Stampin’ Up! order. Simple. Fun. A marvelous gift idea, too! For the FIRST time ever, as a FIRST-time subscriber you can buy your FIRST month and get your second month FREE! MONTH-TO-MONTH SUBSCRIPTION ONLY! Offer invalid if subscription is suspended or cancelled during the first two months. In other words, you cannot cancel or suspend your subscription during your first two months—if you do, the offer is void. Make sure you don’t put your subscription on hold or cancel until after the first two full months. Sign up for Paper Pumpkin through me and I will send you this pen box and a Paper Pumpkin pen as my thank you gift. Each month I offer little treats and extras for my subscribers. This month they will get a box kit sized to fit the test tubes in the kit…perfect for gift giving! It’s easy to change the paper colors for Halloween, Fall, Birthday, or Christmas. I will be ordering extra refill kits this month as I can see using them year round for fun little treats and gifts. I hope you will stop back tomorrow as I start my new alphabet series…The ABC’s with DSP! I will feature projects showcasing Stampin’ Up! Designer Series Paper. Select DSP is on sale all month long…Buy 3, Get 1 Free! Click HERE to SHOP! I LOVE Paper Pumpkin!!! I really did not think I would but it is so easy and yet can be creative at the same time! Best of all is getting together with friends to play with the Paper Pumpkin!!! Have a GREAT Sunday with your daughter!!! Those are really cute cards, Jeanie. Thanks for sharing. You have a great group of players. Hope you had a super Sunday.